There isn't one fly rod that is ideally suited for every situation. By answering a handful of questions, a beginning fly fisherman can determine the rod which best suites their needs. Fly lines are rated by “weights”, generally ranging from 1-9. A 1-weight fly line represents the lighter end of the scale, while 9-weight lines are much heavier. 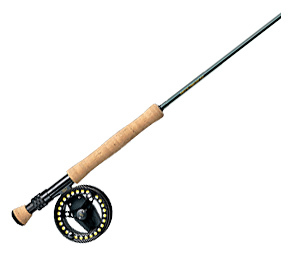 A fly rod of a certain weight is specifically designed to cast its corresponding weight line. What are the major factors you should consider when choosing a fly rod? Fly fishermen have a myriad of species to cast flies to including sunfish, crappie, black bass, smallmouth bass, rainbow trout, spotted sea trout, redfish, snook, and tarpon. As a rule of thumb, the larger the fish, the heavier the tackle you will use. It isn't feasible to catch bluegill and blue marlin on the same tackle. Therefore, your first step needs to be identifying the species you intend to target. Your favorite fishing venue will have a tremendous influence on the tackle you choose. Consider the differences between a tranquil brook, quietly meandering through a beautiful green pasture, a roiling mountain stream, and an azure flat in the Florida Keys. Some of the differentiators include wind, water clarity, stillness of the water, and casting distance required to reach your quarry. Each of these situations requires a different fly rod. Fly rods can be made to flex differently and the different styles are said to have a specific actions, ranging from slow to fast. The designation refers how much of the rod flexes during a cast. Beginning fly fishermen should consider medium to medium-fast action rods as they provide a good blend of performance and sensory input. It is easier to feel a medium action rod loading compared to a fast action rod. Feeling the rod load is essential to learning how to cast properly.